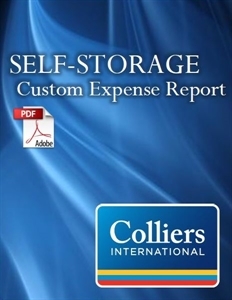 The Self-Storage Custom Expense Report, prepared on demand by Colliers International Valuation and Advisory Services LLC, provides income and expense comparables based on a specific U.S. address provided by the customer. The report offers a comparison against national data as well as income and expense metrics from actual self-storage facilities as close in proximity and type to the subject property as possible. Expenses are broken into nine categories including advertising, general and administrative, repairs and maintenance, offsite and onsite management, property insurance, real estate taxes, utilities, and reserves. With this report, owners of all self-storage property types can receive comparable facility data without having to rely on industry averages that are heavily impacted by national operation styles and may not factor in the unique aspects of your location. Please note: The ownership and facility identification of the expense comparables used in the report are kept confidential and are not included in the report. IMPORTANT: The Self-Storage Custom Expense Report is generated on demand based on a physical address provided by the customer. The report property address may be different from the billing or mailing address on your ISS Store account. In the boxes at the top of the page, please provide the complete, accurate physical address and other requested attributes on which the report should be based. Please allow up to three business days for delivery of the report to your e-mail inbox.